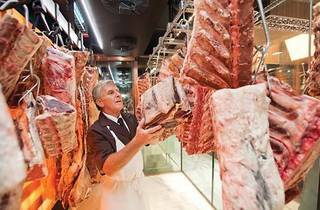 Victor Churchill is a shrine to meat. If Salvador Dalí and Elton John got together to open the world's fanciest butcher, it'd look very much like this. The brass door handles are shaped like sausages. The front window display features something different every week from chicken legs resting on snare drums (drumsticks!) to racks of lamb set on various sized springs (spring lamb!). Just as long as they don't get tongue in cheek, we're happy. 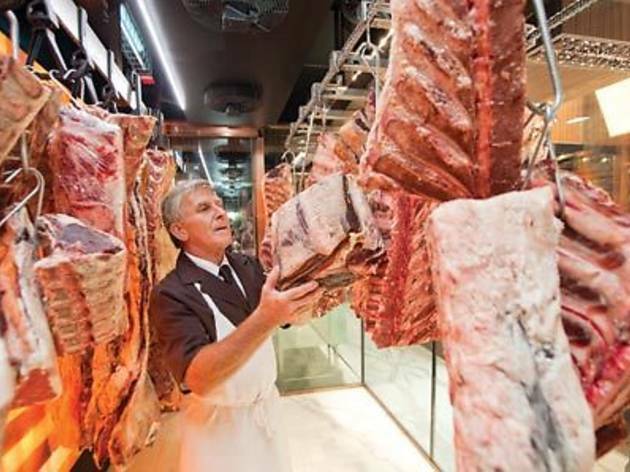 This butcher is brought to you by father-and-son team Vic and Anthony Puharich, owners of Vic's Premium Quality Meat. It's designed by restaurant architect Michael McCann – the man behind Steel, Pony, Flying Fish and the new-look Sydney Seafood School. Inside, an entire wall is inlaid with bricks made from Himalayan rock salt where whole sides of cow dry age. Rows and rows of chickens roast on a rotisserie. In the fridge rest every type of terrine imaginable in proper ceramic moulds, along with confit duck legs, sausages and patés. It's all here: Wagyu beef ribs so marbled, they're more fat than flesh; meat so dry aged it's obscene; in fact, any type of meat, marbled or no, you can imagine. It's not cheap, but you're paying as much for the friendly staff you will answer your every protein-related question as you are for quality and the unforgettable experience of shopping here.